The LALS has a complete operating automatic block control system utilizing signals all around the line. The system is designed for fully bidirectional operation. Many of the regular signal can be seen on other photographs, this page is dedicated to the signal and turnout control system itself. 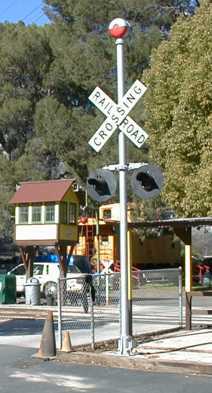 There are several operating grade crossing signals at the LALS. 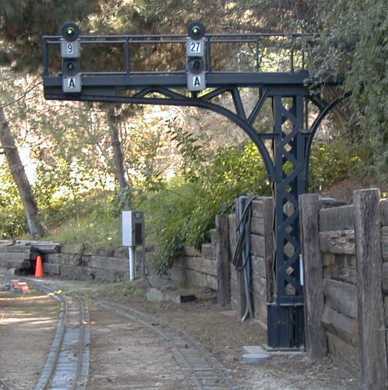 This one is at the main member's entrance where the driveway crosses the main line. This signal is very useful because a driver entering or leaving the facility does not have a very good view down the track in both directions. 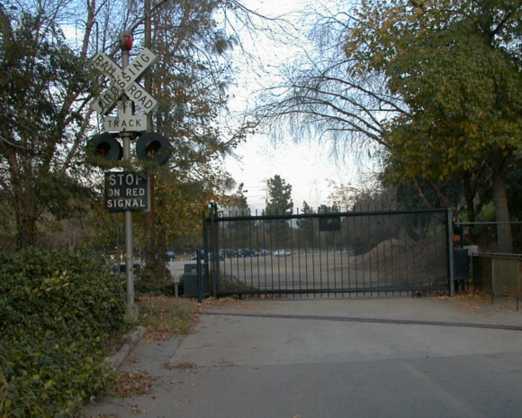 A wigwag signal is located in the next place where the driveway crosses several yard tracks and enters the main inside parking area. A crossing gate is slowly being installed at the same crossing as the wig wag signal. 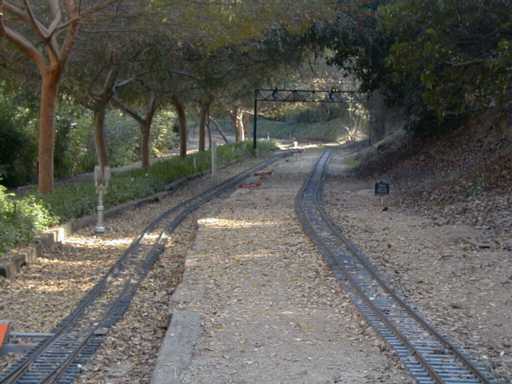 Yet another driveway crosses both main line, station and yard tracks at the passage between the main interior parking lot and a smaller parking area that allows access to a jack for loading and unloading engines onto the visitor's steamup bays for both 1" and 1-1/2" scale equipment. 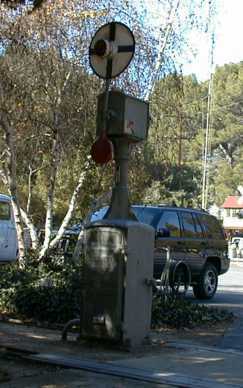 This is a flashing light, bell and crossbuck signal. Out on the "west end" there is a signal bridge that spans two of the three main line tracks. On the main where is passes behind the car barns, a signal tower guards the track. These are fully operational signals. Much of the main line is protected with single target signals. Some of these will show three indications, green, yellow and red. A few will show only yellow and red due to permanent slow orders. The "A" designator on a signal is an absolute indication. This signal may not be passed if it is red. A signal without an "A" posted may be passed with caution at reduced speed. 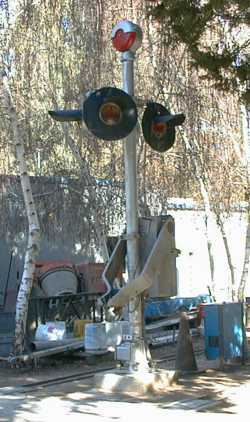 Dual target signals are used to show the status of the main line or of a branch line. If the top signal shows green, an associated turnout is switched for the main and the main is clear. In this case, the main is the curved path leading to the Nelson Tunnel. The top may show yellow or red if the 2nd block ahead is occupied or red if the block ahead is occupied. 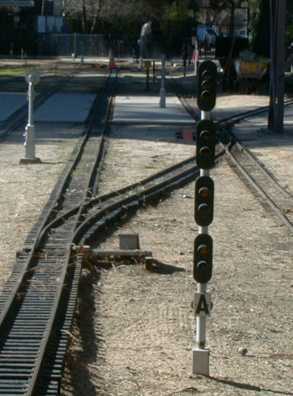 If the top signal is red and the lower signal is lit, then the turnout associated is set for a diverging route off the main. A lower yellow signal indicates that the diverging block ahead is clear and a red indicates that the diverging block ahead is blocked. Several of the signals have 3 or 4 sections depending on the complexity of the following trackwork. In this case, the signal shows the status of the main, and 3 subsequent nested diverging tracks. A couple of the signals are Pennsy style position type indicators. A horizontal bar is the same as a red. 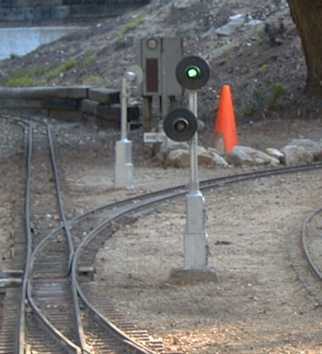 Several spots on station or yard tracks are protected with dwarf signals. These are absolute signals leaving the New Sherwood station. 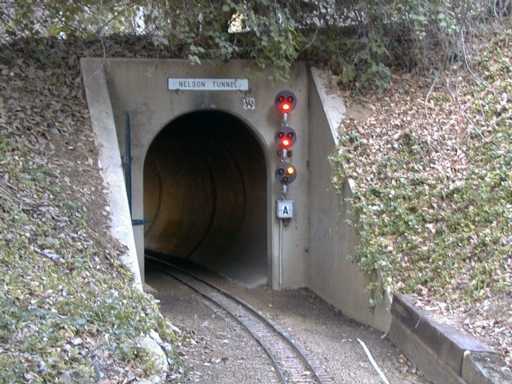 On the east entrance to the Nelson tunnel is an absolute target signal. At the other end of the Nelson tunnel is a stack that shows the status of the main as it passes New Sherwood Station and the status of the two station tracks in New Sherwood Station. 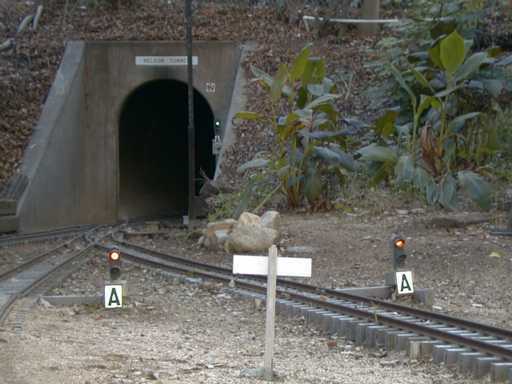 The engineer can use these signals to determine how the turnouts on the other side of the tunnel are set so that he can select his desired route upon leaving the tunnel. 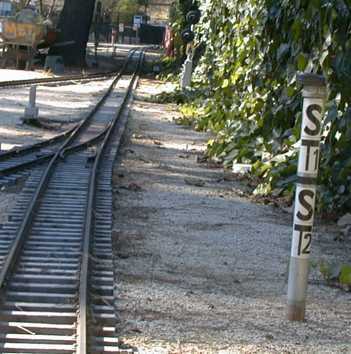 In this case, the turnouts are aligned for station track 2. 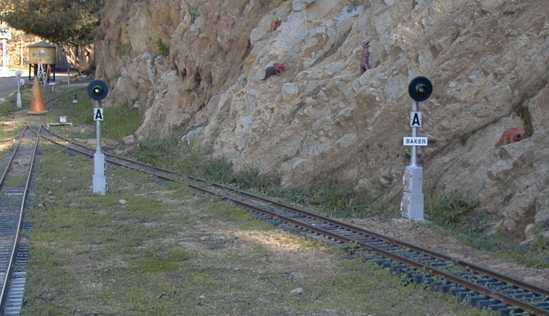 Turnouts are controlled by the engineer with the aid of switches set on posts near the track. 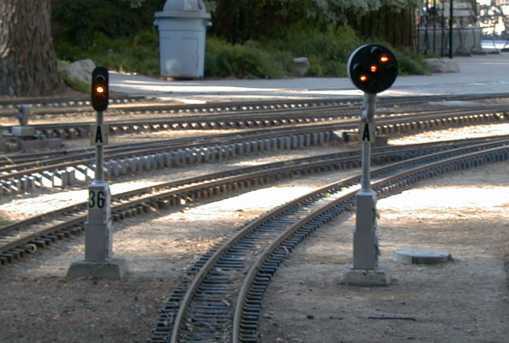 After reading the signals, the engineer can determine if needs to throw a turnout to select his route. This control selects between New Sherwood Station track 1 or track 2. Track 1 is the "main" as indicated by the following signal. 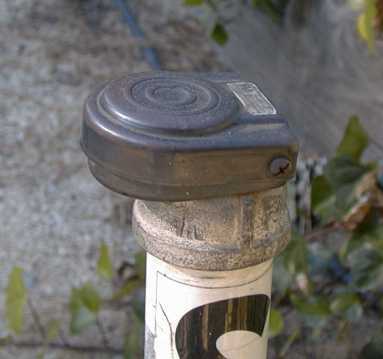 The switch itself is just a foot treadle switch mounted on a piece of pipe. These switches have proven to be durable and can be activated just by mashing the top with a fist or the flat of a hand. This isn't part of the automatic signal system. 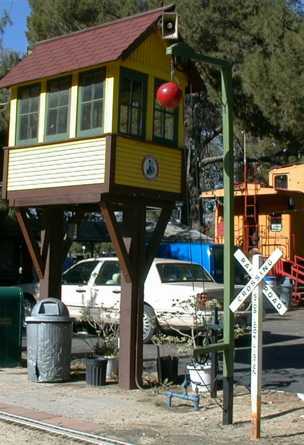 The highball signal hasn't been used by real railroads for at least 150 years.